I've done it! I bought a new box of Skitarii and built 3 Skitarii Rangers and 7 Skitarii Vanguard. I did my own modifications to get multiple special weapons, so several of them look weird, but who cares? I'm buying them not for the precise representation but for the tabletop anyway. And I love Skitarii special weapons. So basically my Skitarii has received a bunch of reinforcements! Too blurry to see, sorry. 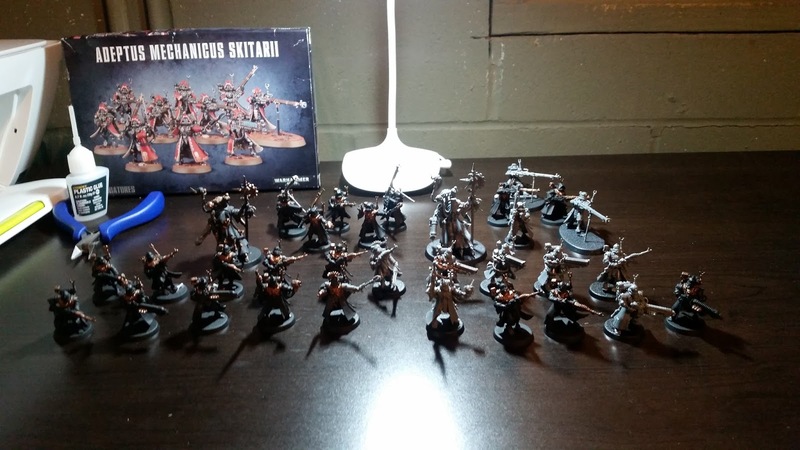 So this is what I have: 2 5-men Skitarii Vanguard with 2 plasma calivers each, 2 5-men Skitarii Rangers with 2 transuranic arquebuses each and a 10-men Skitarii Vanguard with 3 arc rifles. I can swap 2 of the Skitarii Rangers' transuranic arquebuses for 2 arc rifles instead - if you can't see it clearly in the photograph basically instead of kit-bashing or gluing the transuranic arquebus to the existing arc rifle Skitarii Rangers, I just slung them over their shoulders. So whenever the battlefield requires it, they can immediately swap from arc rifles to transuranic arquebus, and then back again. Oh, and 2 Tech-priests Enginseers for the HQ. Don't forget I still have Belisarius Cawl and 6 Kataphron Destroyers lying around elsewhere. All I need now is a Tech-priest Enginseer. Basically I can aim for a Brigade eventually, but for now I'll be trying out the lists I have in a previous post. I still don't have any Sydonian Dragoons, and I only have 4 Kastelan Robots with heavy phosphor blasters and no Kastelan Robots with incendine combusters and Kastelan fists. Should I get them, or is my army already all right? I mean, I'm using Mars mostly, so Belisarius Cawl and the heavy phosphor blasters Kastelan Robots should work much better than whatever melee units I try to get for my army. I have my Imperial Knights for that. But gosh, those Stratagems cost a lot. I'll be using Wrath of Mars and Elimination Protocols and perhaps the Kastelan Robots Protocol change a lot, and those cost me almost all my Command Points. Oh well. We'll see. I might have a 4,000-point game on Saturday against a whole bunch of Orks and a Stompa, so I can't wait to see how that works out. 3 Imperial Knights in a Super-heavy Detachment and 2 Adeptus Mechanicus Battalion Detachments. Now that's a sight to behold! And that nets me 9 Command Points, so I'll have 12 in total. The problem is that I'll hardly have any opponents except the Ork guy to play 4,000-point games with. Still looking forward to it. I'll let you guys know if it happens (because...well, I don't know if it's feasible and I always arrive in the store in weird timings). One thing is for sure. 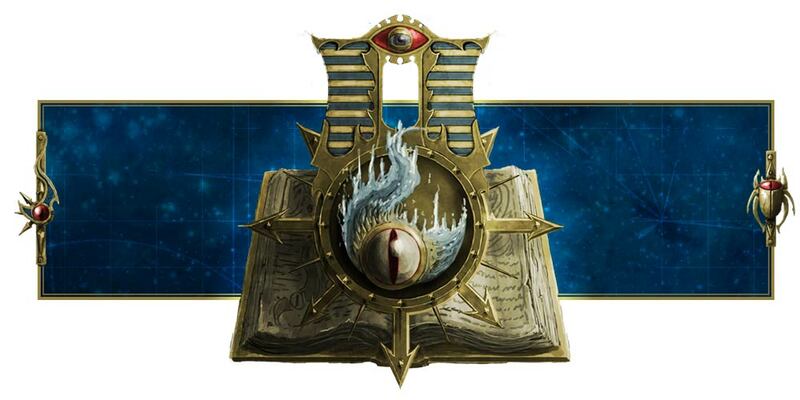 Once I get my new codex on Saturday, I'll be trying out the new Stratagems and rules!